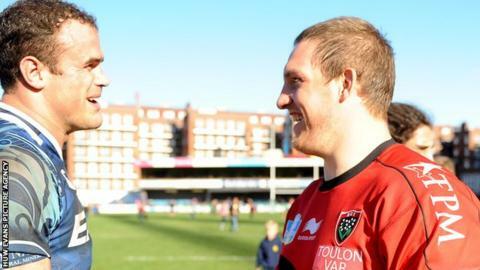 Cardiff Blues have confirmed Wales prop Gethin Jenkins will rejoin the region from Toulon for the 2013-14 season. Jenkins left the Blues at the end of last season to join the French club on a two-year contract. The 32-year-old has largely been second choice to England's Andrew Sheridan and had been heavily linked with a return to Wales. "I'm delighted to secure his [Jenkins'] services," Blues chief executive Richard Holland told BBC Wales. "I know Phil Davies [director of rugby] is excited about how the squad is coming together for next season. "Everyone knows we have got some issues in the front row and and now Gethin to come in is a huge coup." In December, the Blues said they had but a deal has now been secured to enable the 96-times capped Jenkins to come back from France a year early. "I am really pleased to have re-signed Gethin," said Cardiff Blues director of rugby Phil Davies. "We started the year knowing we had a young squad and it has been a massive season of progression, sometimes the results have not gone our way. "Gethin will be coming back to an environment that is a little different from the one he left and I think, hopefully, he will enjoy it and I know that he will add a massive amount to the group. "I have heard how professional he is and I am really looking forward to working with him and welcoming him back to the Blues. "Gethin's experience will add to the team, he is very vocal on the pitch and I am sure that a lot of the youngsters will also be very vocal with him as well next year. "The experience of Gethin, Matthew Rees along with the likes of Gavin Evans and Dafydd Hewitt who are really experienced players will help." Holland also confirmed New Zealand-based Samoan lock Filo Paulo will arrive at the Arms Park in the near future with the player's United Kingdom entry visas having been secured. The Welsh Rugby Union, concerned by the loss of Wales' best players to France, had been involved in the earlier the negotiations to bring Jenkins back to Wales. No financial support was part of those discussions, according to Blues chairman Peter Thomas, and Holland says no fee has been paid by the Blues for Jenkins' release from the second season of his Toulon contract. The Blues had previously persuaded Alex Cuthbert to sign a new three-year contract, even though their options are limited by a £3.5m salary cap. Cuthbert's decision to stay in Wales bucked the current trend of a player drain to France, which saw Jenkins, Mike Phillips, James Hook and Luke Charteris among the Wales internationals moving from Welsh regions. The Blues have failed to keep Jamie Roberts, though, who has announced his intention to leave at the end of the season. Racing Metro is the centre's expected destination, with the same club tipped to sign flanker Dan Lydiate from Newport Gwent Dragons.